Jon Stewart went Kanye cray on them, and rightfully so. (Greta Van Susteren also criticized her colleagues.) And in this case Bolling did say sorry for his sexist remark, though he did it in the most sexist manner possible: “I got home and got the look so I apologized to my wife and I apologize to you.” Nagging ladies, even the one I’m married to, don’t get jokes! So much word vomit from this guy. 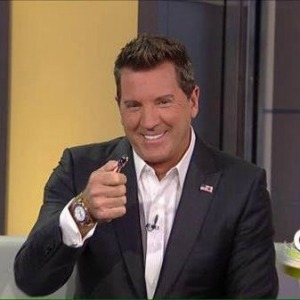 But actually, the troops — both men and women — weren’t too happy about Bolling’s offensive comment either. And they wrote an open letter to express their disapproval. In the letter published on Talking Points Memo, a number of military members from across the spectrum of the armed forces rebuked Bolling and Gutfeld’s chuckles at the expense of Major Mansouri. Not only do they cite the American women who have been flying into dangerous situations since WWII, but straight up, they tell him he’s no comedian. Oh my goodness. This letter is making my whole day/week/month right now. They end by apologizing to Major Mansouri on behalf of Bolling and offering her our gratitude for what’s she’s doing. Yes indeed. When you have to make it known that you’re being sincere — like, for real this time, I’m sorry, seriously guys — there’s a problem. When you have to apologize twice, also a problem. It feels like the apologies were based on the backlash more so than a real feeling that something he said was wrong. Everyone out there: Here’s a lesson in how not to say sorry. And FYI, if you’re interested, Al Jazeera published this interesting column about women in the military in the Middle East. It’s a short read.